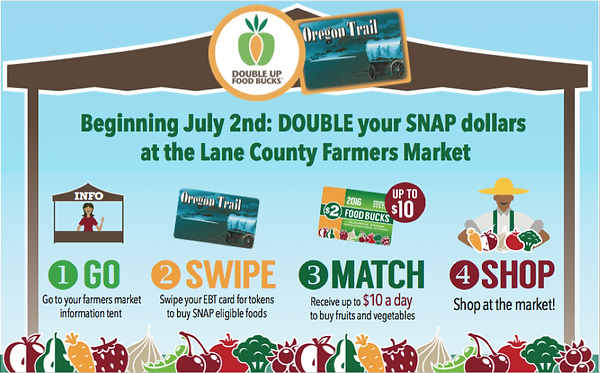 Don’t forget: starting on July 2nd, the Lane County Farmers Market will Launch the Double Up Food Bucks program for SNAP participants. This program is sponsored by the Willamette Farm and Food coalition, an organization dedicated to helping feed Oregonians fresh, local, healthy food. How it works: SNAP participants will receive $2.00 in Double Up Food Bucks for every $2.00 of SNAP benefits they redeem at the farmers market up to $10.00 each market day. By encouraging SNAP participants to buy local produce, we are helping to keep our farming community healthy while providing the most nutritious food available to keep people healthy, it’s a win-win for everyone. June 25, 2016 in hunger, Local Businesses.